Karzai said Ready to Talk to Taliban; H. Mahsud’s Death Questioned; Is Afghanistan a Potential Oil State? Reuters reports that President Hamid Karzai is calling upon the Taliban and other insurgent groups to drop their demand that foreign forces leave the country before agreeing to attend a Loya Jirga or national tribal council in six weeks to seek reconciliation with the Karzai government. Karzai says he will go to Riyadh to seek Saudi mediation, though Foreign Minister Saud al-Faisal says that the kingdom will only host talks if the Taliban and other guerrillas drop their ties to al-Qaeda. Omar, the son of Usamah Bin Laden, maintains that al-Qaeda Arab fighters and their Pashtun Taliban hosts are not in fact close, and that their alliance of convenience is riddled with disagreements. Radio Azadi reports in Dari Persian that center-right Pakistani politician and former prime minister Nawaz Sharif says that the Pakistani government should initiate the reconciliation talks with the Taliban. 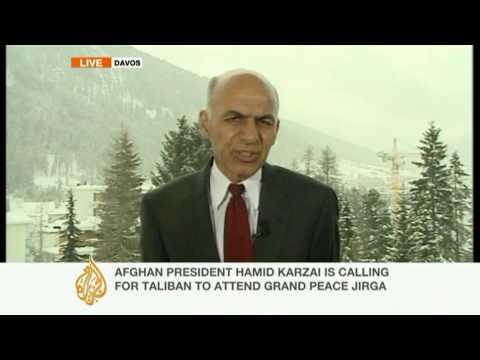 Aljazeera English reports that Ashraf Ghani, former presidential candidate, is confirming that the Afghanistan government has been talking to the Taliban and other insurgents behind the scenes. Meanwhile, US Marines and troops fighting the insurgents find themselves embroiled in an unconventional struggle in which the enemy has many advantages. There has been no winter lull this year, as the Taliban and other guerrilla groups have resorted increasingly to roadside bombs and sniping at US troops, filling them with anger and desire for revenge. Some 29 US troops were killed in January in Afghanistan, up from 15 in January of 2009. Commanders are attempting to restrain the US military personnel from revenge attacks that would only end all hope of winning local hearts and minds. On the Pakistan side of the border, the Pakistani military is investigating press reports that a US drone strike may have killed the leader of the Pakistani Taliban Movement (Tehrik-i Taliban Pakistan or TTP), Hakimu’llah Mahsud. The Taliban maintain that Mahsud is alive. He was pictured in the martyrdom video of the Jordanian double agent, Humam al-Balawi, who attacked the CIA’s Forward Operating Base Campbell in late December. He has also been behind a string of deadly bombings against civilian and military targets inside Pakistan. The TTP faces increasing public anger in Pakistan, and in this weekend’s by-election in the Swat valley, which the Movement took over last winter-spring before being forcibly expelled by the Pakistani army this summer, a secular Pashtun nationalist candidate won, defeating more conservative and religious aulternatives. The Pakistani Taliban are driving the Pakistani public into the arms of the secular parties.